August (le mois d’Août) is a popular time to go to France. But only pronouncing this word can be tricky, especially since there are often many elisions involved. So, train with my clear audio recording to understand/be understood by the French. Dismiss the accent (if any). Do pronounce the final T.
The correct pronunciation of août is “oot”. What really confuses students of French however are the liaisons/elisions/glidings we make with “août”: since “août” starts with a vowel, there are going to be many liaisons, elisions and glidings involved – the final consonant of the word before “août” is going to add a D, or a N, or an R… before the “oot” sound (More about French liaisons, elisions and glidings here). You absolutely need to train with audio to pronounce that word correctly and get a chance to be understood – and understand French people when they speak. Le mois d’août (the month of August) – sounds like doot. Nous sommes en août (we’re in August) – sounds like noot. This is particularly difficult when you use “Août” with a number, as in saying the date in French. Le premier août (the first of August) – sounds like root. Le deux août (the second of August) – sounds like zoot. Le cinq août (the fifth of August) – sounds like koot. Le sept août (the seventh of August) – sounds like toot. Le neuf août (the ninth of August) – F makes a liaison in V – sounds like voot. Many French people take their summer vacation in August. So, you will see a huge number of businesses closed during this month, particularly in big cities that are deserted for the vacation. On the contrary, small boutiques in touristic areas are likely to flourish and have extended open hours. Going to Paris in August? Is a good idea if you want to see tourists and not the Parisians. Parking is a dream in Paris in August (well… compare to the norm that is…) but many shops are going to be closed, and some restaurants as well – so call to check. Museums are open, no problem there. If you’d like to practice your French in Paris, check out these Paris French conversation tours. Watch out if you are planning on driving / traveling around the 15th (la mi-août). Traditionally, that’s a moment when many French people are on the road – either leaving for their summer vacation or coming back. So avoid driving around that date – especially if it’s a week-end! 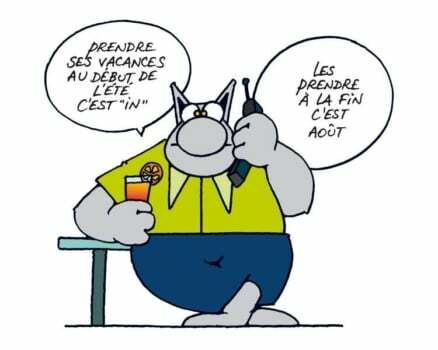 Taking your vacation at the beginning of the summer is “in”, taking them at the end is “out” (pun with août). People taking their vacation in July (juillet) are called “un juilletiste, une juilletiste”. Where to Vacation in France to Practice Your French? 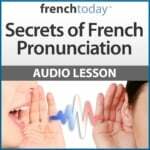 Learning French in context: check out French Today’s downloadable French audiobooks: French Today’s bilingual novels are recorded at different speeds and enunciation, and focus on today’s modern glided pronunciation.